Our featured Adoptables this week are from No Kill Harford. Hi, my name is Elton. I am a mutt! I am such a love! I get along great with other dogs and I try so hard to please. I love to snuggle and am working hard on my potty training. I do well if I can make it out at regular times. Hi everyone!! I’m Chloe! 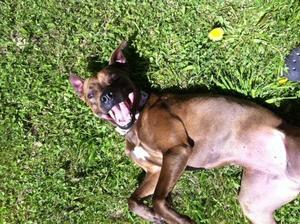 I LOOOOOOOVVVEEE to roll around in the grass, like I really, really, really do! Come meet me and take me on a walk! I’m about 2yrs old and I listen well to commands like “sit” , “look”, “stop” and “wait”. I am house trained and very tidy with my bed, too. I really like going on walks and have lots of energy, do you? We should meet and go on a hike together! Chloe is up-to-date on all vaccines, microchipped, heart worm negative, de-wormed, flea-free and spayed. I just found out that the sweet Chloe was adopted! Yay!!! !